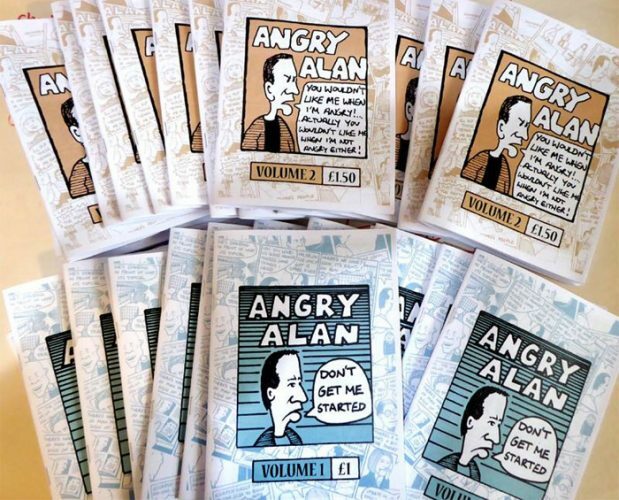 So says Angry Alan in the cartoons invented by Paul Hunt, who has included his anti-hero in the Nerve Magazine from it’s inception, up until five years ago, in the free volunteer based Liverpool community publication. Now they come in two volumes 2002 – 2006 and 2007 -2013, charting how everyday interactions in society can lead to something more perverse in the ever more complicated existence of city life. It is unclear where Alan belongs but he is surrounded by mates like ‘Do Nothing Dave’ and ‘Boring Bob’ who do nothing to alleviate the existential malaise he wakes up with to every morning. His is a humdrum existence complaining about what everyone else appears to just get on with. 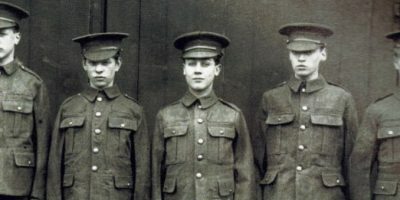 There is lots of sympathy though for his character as he undergoes the frustrations of being stuck in the queue in the Post Office or the wrong check-out till in the supermarket; of not being left alone in peace at home or having to spend stultifying hours in the company, or not, of friends in the Sad Cafe. Then there are the privations of new technology in the form of the mobile phone or yuletide exertions when shopping for socks becomes a nightmare. We have all been there. The cartoons are not over complicated but have enough content to lead the reader to a sometimes enigmatic ending. There is good indirect infilling with marketing inviting you in to ‘consume to your doom’ in the Christmas shopping story or how young love is thwarted in Walkabout. To break up the doom and gloom the illustrator has included real items of his work that have promoted events taking place at the time of publication like the Liverpool Radical Film Festival or original cartoons for the likes of the North Wales Vegan Festival. to add to the mix Miss Anne Throppy gets her own run out as does ‘Me and My Big Mouth’ a blast from the past from Dregs Magazine. These compact volumes are not a heavy read but the chagrin contained in them cannot fail to raise eyebrows or bring a sardonic twitch to the mouth. If you are in News From Nowhere on Bold Street you can judge for yourself for that’s where you will find them. Finally everyone has their own pet annoyances which have not been covered here, yet. For me it’s film goers who leave more popcorn ground into the cimema’s carpet than they actually eat. You can find out more or send ideas to dustville.co.uk. Paul Hunt will not be annoyed in the least.